The aim of the Worldaware Business Awards was to recognise the vital role which commercial activity plays in supporting economic and social progress in the developing countries. The scheme has shown that organisations, large or small and operating in highly diverse markets, can make and are making a difference to the lives of people in the developing world. Once entries had been received, a panel of Assessors in each category considered them. The Assessors asked further questions of the entrants and references were taken. Each Assessor’s panel prepared a short-list which was then presented to the Judges. 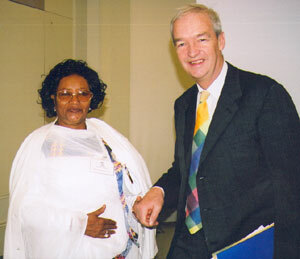 Ababech Gobena from Ethiopia and Jon Snow Worldaware Business Awards 2004. A key figure, such as newscaster Jon Snow, presented the Awards in venues such as The Royal Society in London. The Awards attracted significant media coverage. 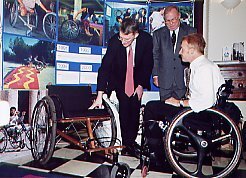 Hilary Benn MP, Sir Jim Lester (chairman, Worldaware) with David Constantine from Motivation. Worldaware Business Awards 2002. A further Award was made to Motivation in 2005. All winning and short-listed entries were fully described in the Worldaware Business Awards website. Now closed.